A solid earnings report boosted Bunge shares at the end of the month, but the details show that weak commodity prices are still a major factor for investors. Image source: Flickr user Josh Hallett. 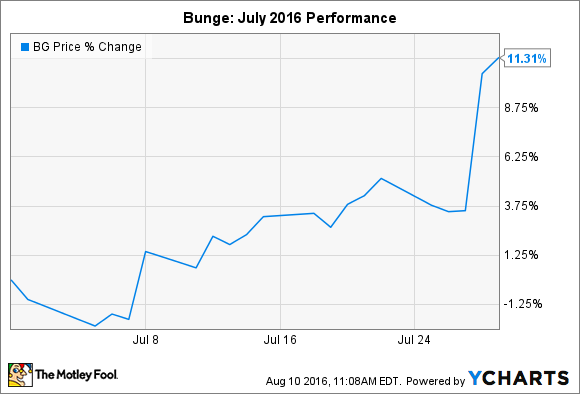 What: Shares of agricultural products company Bunge (NYSE:BG) ended July on a positive note after strong second-quarter 2016 earnings. So what: Among the highlights from the quarter was a 62% increase in EPS to $0.81, compared to $0.50 in the year-ago period. Bunge is highly dependent on commodity prices, such that volatile swings equate to lackluster results for shareholders and the company. These factors muted earnings in 2015, but management pledged to tighten belts and focus on higher-value markets when possible. And tighten belts it did. In fact, significantly lower selling, general, and administrative expenses in the most recent quarter accounted for essentially all of the year-over-year gain in net income. The line item fell 26%, from $361 million in the second quarter of 2015 to just $303 million in 2016 -- a drop of $58 million. That resulted in a $37 million increase in net income in the same comparison period, while a reduction in shares outstanding helped push earnings per share a few cents higher still. Capital efficiency is great for investors. However, it's important not to confuse it with improving market conditions. Quarterly revenue actually decreased year over year, while revenue in the first half of 2016 was nearly 10% lower than the watermark from 2015. The drop in revenue was achieved despite a year-over-year increase in volumes sold in all but one of the company's operating segments. In other words, Bunge continues to operate in a challenging market environment. Now what: Investors should be encouraged that management is doing everything it can to ride out weak market conditions. After all, shareholders certainly cannot complain with a 62% increase in EPS from the same period in 2015. But as the details show, the next few quarters won't necessarily be easy to navigate.